St. Scholastica will soon begin offering a bachelor of arts in management in Grand Rapids on the campus of Itasca Community College. St. Scholastica has a longstanding relationship with ICC, which has hosted its programs for more than 25 years. 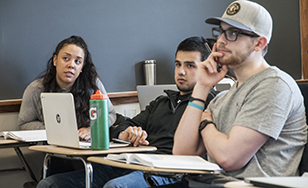 Students are invited to apply now for the BA in management, which starts this fall. "We are very excited to partner with Itasca Community College by offering our Bachelor of Arts in Business Management and holding classes right on their beautiful campus," said Kathy Modin, Chair of the Management Department in the School of Business and Technology. "We are looking forward to the role we will play in developing and inspiring ethical business leaders in the Grand Rapids community." Prospective students are invited to learn more about this new offering during an information session from 5-6 p.m. Wednesday, April 17, in the Timberlake Lodge Boardroom in Grand Rapids. Separately, St. Scholastica will also host an information session for one of its graduate business programs, the MBA in Leadership and Change, from 6-7 p.m. on the same day, April 17, in the same location, Timberlake Lodge Boardroom. This MBA is offered at the main campus in Duluth. Visit css.edu for more information.